"Not to-day, Bunny, I swear!" "You mean to tell me you really did start with the bare idea of finding a place to hide in for a night?" "It was to be the mere reconnoitre you pretended?" "There was no pretence about it, Bunny." "Then why on earth go and do what you did?" 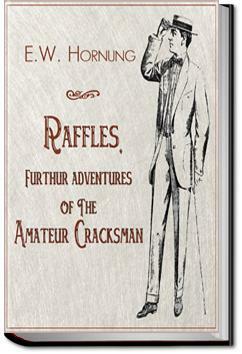 "The reason would be obvious to anyone but you," said Raffles, still with no unkindly scorn. "It was the temptation of a minute—the final impulse of the fraction of a second, when Roberto saw that I was tempted, and let me see that he saw it. It's not a thing I care to do, and I sha'n't be happy till the papers tell me the poor devil is alive. But a knock-out shot was the only chance for us then." "Why? You don't get run in for being tempted, nor yet for showing that you are!" I preferred the capers of the first book to the attempt to go deeper here; the characters of Raffles and Bunny are too slight to sustain it. They worked better as figures of whimsy. Pity. Worth reading for easily one of the most touching relationships in literature between the narrator and the gentleman-burglar. Thick-and-thin lifelong male friendships were rarely better explored. I say, Raffles is starting to grow on me, what? This one is quite well written, has more depth and is more about Bunny and their ridiculous and juvenile relationship - is even a little moving despite the faintly (?!) ludicrous plot. Onward chaps. I did think that this was improvement on the initial book as each new story within The Black Mask gave us a further glimpse into the hidden character of Raffles and a closer inspection of his many methods of thievery. Yes, it's surprisingly good and I really am surprised.